But Air Explorer also supports other clouds, famous in their countries of origin as Baidu, Naver (네이버 클라우드), Cloud.mail.ru and Yandex. They are very powerful clouds that we can be accessed very easily from any country and offer us a lot of storage space. Baidu give you 2TB of free storage, Yandex 10GB, Naver, 30GB and Mail.ru offers 25GB. Don’t miss the oportunity to try these clouds with Air Explorer. -Added hash synchronization support for Dropbox. -Fixed max 500 items in Mail.ru folders. -Hash synchronization option was not displayed correctly for saved tasks. -Filter and custom synchronization options were not displayed correctly for saved tasks. -Show the Air Explorer version in the logs. -Reduced the chances of getting max requests limit on Box. -Fixed uploading files to Mediafire. -Fixed saving synchronizations with accounts with the same name for the same cloud but different alias. 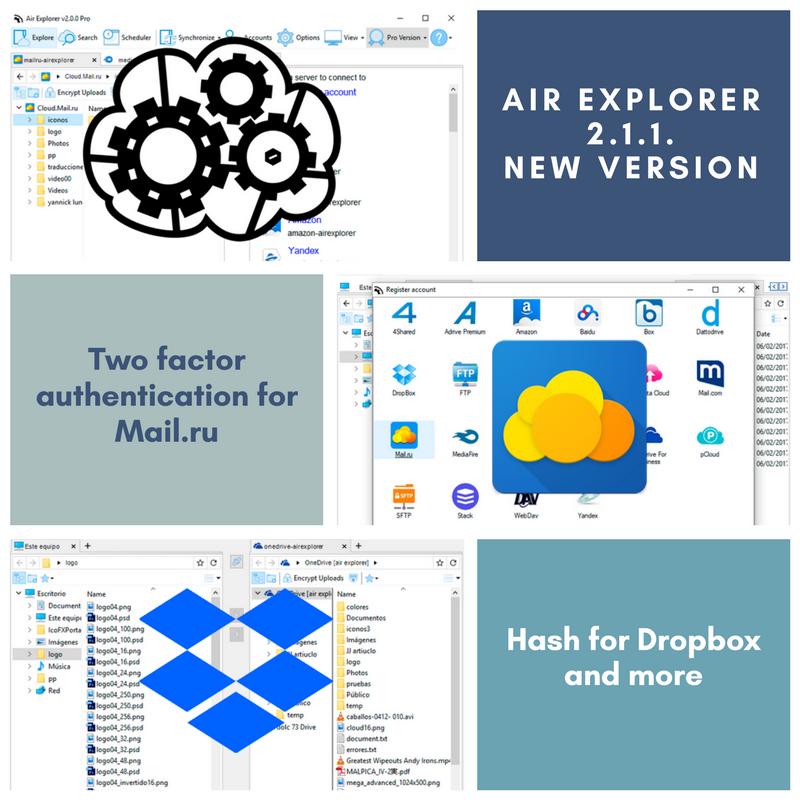 Air Explorer is always adding new cloud file servers as a Cloudmail.ru to be the most complete software to manage cloud servers. Cloudmail.ru is a Russian cloud server that gives you 25 GB of free for your files. You can add it to Air Explorer easily. 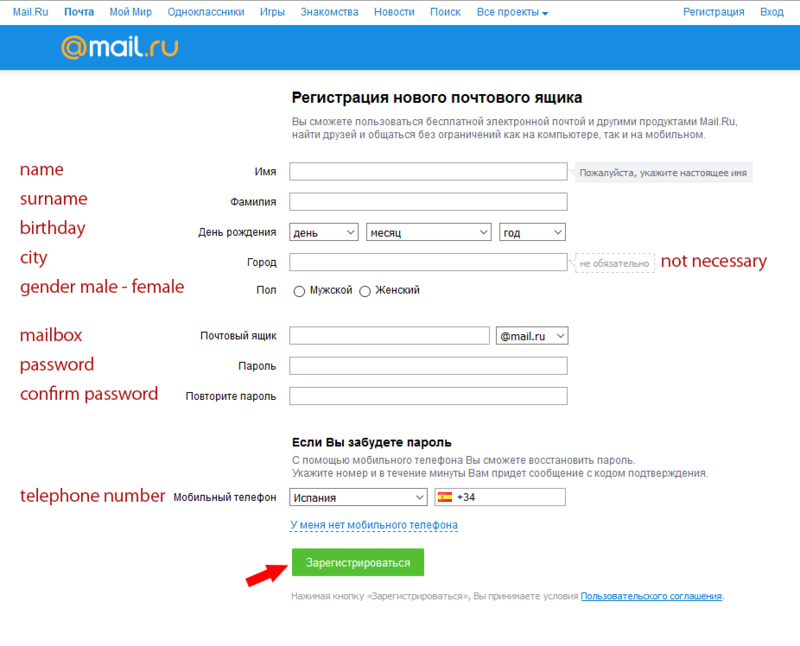 First sign up in Cloudmail.ru and create your own account. Part of the sign up process is to create an email account. 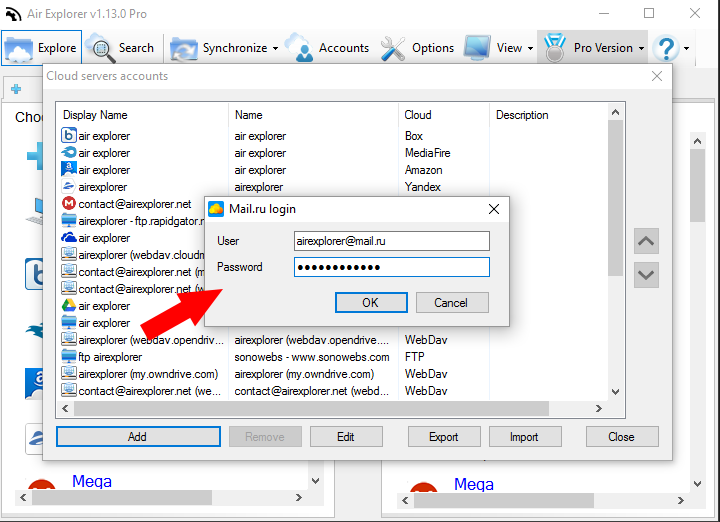 When you finish to sing up in Cloudmail.ru, in Air Explorer open the Account window, select the Cloudmail.ru logo and enter your user/email account and password. Then you can work with it. 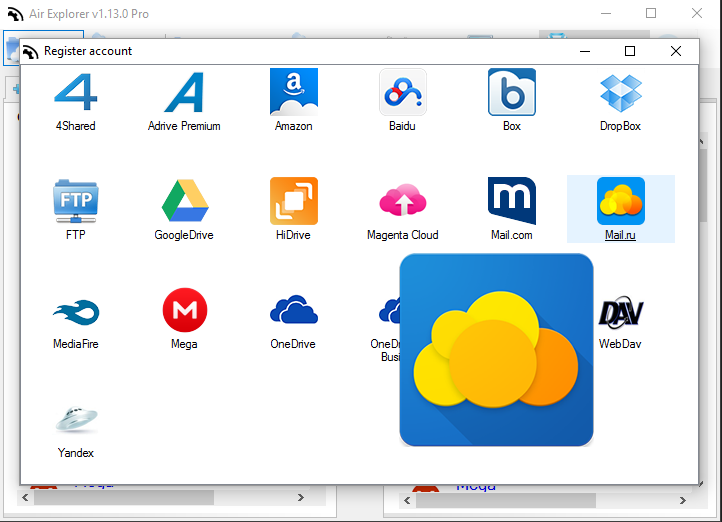 Cloudmail.ru support in Air Explorer includes viewing thumbnails, file searching, transfers to and from other servers, etc. -Added Cloud Mail.ru support (files up to 2 GB). -Fixed FTP connections to some servers. -Fixed FTP file dates for some servers. -Play audio files online with VLC or your default player. -Fixed save synchronization button was not visible in low resolution screens. -Updated Polish translation (thanks to Janusz). -Updated Lithuanian translation (thanks to Hobis). -Updated Japanese translation (Thanks to Tilt).